I saw and tried this dish from the ‘Good Cook’ Simon Hopkinson…. and WOW what a dish! 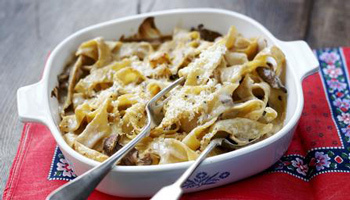 Bake pasta for a bubbling sharing-at-the-table dish. Can you resist the aroma of cheese, pancetta and porcini? Warm the milk in a saucepan, add the porcini mushrooms, remove from the heat and soak for 10 minutes. Strain through a sieve suspended over a bowl, pressing lightly on the mushrooms with the back of ladle to extract all the milk. Heat the butter in a clean saucepan, add the flour and stir over a low heat for 2-3 minutes without colouring the roux. Pour in the porcini-flavoured milk all in one go and whisk together vigorously until smooth. Cook the sauce for a further 10 minutes, or until the sauce has thickened. Season lightly with salt and freshly ground black pepper and set aside. Place the pasta into a lightly buttered oven-proof dish. Smooth the surface and cover with two tablespoons of the parmesan. Bake in the oven for 30-40 minutes, or until bubbling around the edges and golden-brown.Serve the dish piping hot at the dinner table and have extra cheese at the ready.Serve the dish piping hot at the dinner table and have extra cheese at the ready.